James Boicourt has been making mead for 15 years after first taking up beekeeping after an introductory college entomology course. A homebrewer at the time, he decided to take the extra honey from the hives and try making mead. The first results were a lot lighter and tastier than expected, and the idea of one day brewing it commercially was born. 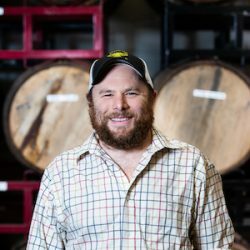 After college, James worked as an engineer but continued both beekeeping and mead making with large experimental batches taking up living room and counter space. With a lot of help and testing from friends, dry and refreshing meads quickly become the focus, and in 2014 Charm City Meadworks was launched. What started as a hallway full of carboys has since grown into one of the largest wineries in Maryland. As Master Beekeeper, James continues to support pollinator awareness, beekeeping, and education efforts in the community. Keep an eye on Charm City’s website for upcoming news about new products, mead making, and beekeeping classes.